Union Finance Minister Arun Jaitley on Monday introduced the Central Goods and Services Tax (CGST) Bill, 2017, along with three other GST bills in the Lok Sabha. The CGST Bill will enable levy and collection of tax on intra-state supply of goods and services or both by the central government. Jaitley also tabled the Integrated Goods and Services Tax Bill, 2017, which provides for the levy and collection of tax on inter-state supply. The Goods and Services Tax (Compensation to States) provides for compensation to the states for the loss of revenue arising on account of implementation of the GST. The Union Territory Goods and Services Tax Bill, 2017, will enable levy and collection of tax on intra-state supply of goods and services or both by the union territories. As the Finance Minister stood up to introduce the CGST Bill, Congress member K.C. Venugopal raised a point of order and said the bill was not part of the list of business. However, he added that he was not opposing the bill's introduction. Minister of State for Parliamentary Affairs S.S. Ahluwalia said the bills were approved late Friday night, and the Lok Sabha Secretariat was closed during the weekend. He said the bills were uploaded on the government website on Friday midnight. 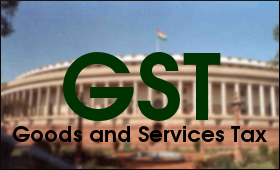 Several opposition members, including Congress leader Mallikarjun Kharge, All India Majlis-e-Ittehadul Muslimeen leader Asaduddin Owaisi and Trinamool Congress leader Saugata Roy opposed the way in which the GST bills were introduced. Lok Sabha Speaker Sumitra Mahajan said: "It (four Bills) was circulated (on Saturday), but not listed in today's (Monday) list of business. I have given the waiver." The bills were later listed in a supplementary list of business on Monday.